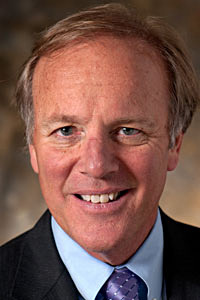 Bill Ayer is the retired chairman and chief executive officer of Alaska Air Group, the parent company of Alaska Airlines and its sister carrier, Horizon Air. Ayer, 64, served as chief executive officer of Alaska Air Group and its subsidiaries through 2012 and as chairman through 2013. A veteran of more than three decades in aviation, Ayer began his career with Piper Aircraft Company and was the founder of Air Olympia, a small commuter airline in Washington State. He joined Horizon Air in 1982 where he held a variety of marketing and operations positions. He joined Alaska Airlines in 1995 as vice president of marketing and planning and subsequently held the posts of senior vice president, chief operating officer, and president. In 2002 he became the carrier’s chief executive officer and in 2003 he was appointed chairman. Ayer serves on the University of Washington Board of Regents. He also serves on the Honeywell Board of Directors, the Board of Trustees at the Museum of Flight and the Board of the National Air and Space Museum. Ayer was a member of the FAA’s Management Advisory Council and is past chairman of FAA’s NextGen Advisory Committee. He serves on the National Business Aviation Association Board as well as the AOPA Board of Trustees. He also serves on the Board of an early stage company, VICIS. A graduate of Stanford University with a bachelor’s degree in economics, he earned a master’s degree in business administration from the University of Washington. Ayer owns a Piper Malibu, and holds ATP and flight instructor certificates with over 5000 hours of flight time. He and his wife, Pam, are residents of Bellevue, Washington and have one daughter, Elizabeth. He served as Chair of the Board of Regents for 2015-16.